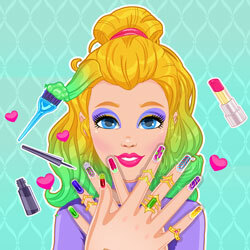 Description: Join Audrey on a trip to the Beauty Salon and prepare yourself to be amazed! Create a whole new style for Audrey. Choose the eyelashes, the perfect make up and add some lipstick and blush. Mix and match to find the right color hair for her look, and then choose the perfect color for her nails and some beautiful accessories to complete her glam look.